The Albert & Ann Deshur JCC Rainbow Day Camp provides an inclusive traditional day camp experience for every child regardless of physical, developmental or financial situation. We believe every child should have a summer of play – a place to be a kid, make lasting friendships, explore new skills, be healthy, learn values, discover their Jewish identity, and be with counselors full of life and love. Our unique camp community welcomes all children to experience a summer of fun, friendship, and opportunities for new and exciting challenges. With state of the art facilities and over 110 picturesque acres in Fredonia, WI, campers can thrive as they try new things, develop friendships and create lifelong memories. Take a dip in our 5 lane swimming pool, explore our adventure playground, maneuver your way up our 40ft climbing wall and zip line your way down. With programs for all ages, K5 through high school, there’s something for every child to create an unforgettable summer. Try Jedi Academy, RDC Chopped, Musical Theater, Lego Xtreme, and more. Our 110-acre facility in Fredonia allows children to experience and embrace the outdoors. Our family of staff is what makes camp special. Become part of the RDC team and experience a summer like no other. Before school. After school. No School. Kids Center has got you covered. 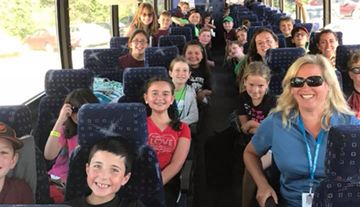 After the last bus leaves RDC, spend those last weeks of summer at JCC Specialty Day Camps. Plan your event at our beautiful facility with modern conveniences and rustic outdoor charm.